One of the first things we had to do was paint the dining room. Beige and white make me a little crazy and I have learned over the years that color is really important to my psychological well-being. 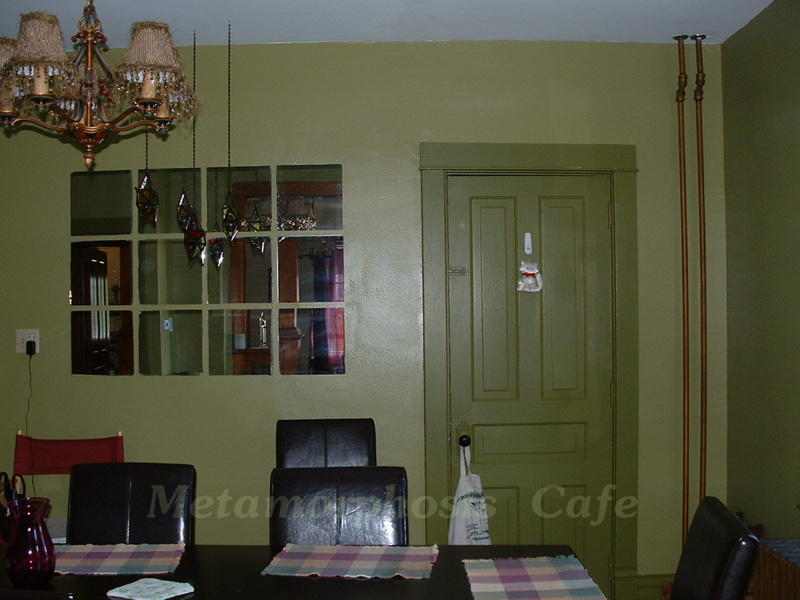 I had seen a really nice green combination on a paint ad and I knew that I wanted my dining room to have that color combo. Since the woodwork was painted in that room I was fine with painting it again. So before spring even approached my daughter and I tackled that project with Sherwin William Harmony zero VOC paint in satin finish. It has held up these almost 8 years well. Seemed kind of chalky going on so I wasn’t sure if it would last but it has. The smell didn’t bother me when I was applying it. I usually like a semi-gloss finish so that I can scrub walls since I have young grand children but it did not come in that finish. It has proven to be quite washable though so I have been satisfied with it. We also found really attractive shades for the antique chandelier that dressed it up and made it look so much better. The green really brought out the bronze color in the old water pipes as well – we have been really happy with the color choice over the years. It was important to us also to try to stay true to the style of the home when we chose our colors. This color scheme seems very appropriate for this house. In time I decided that I wanted the ceiling to be a bit lighter shade of green instead of white since the ceiling was so high. When we took down the chandelier we saw a green paint on the ceiling underneath the fixture that was almost identical to the color we chose to paint on the ceiling. 🙂 I knew the green was meant to be.